As you know, the Boy and I are breakfast aficionados and are constantly on the look-out for more breakfast spots for our growing repertoire in this department. 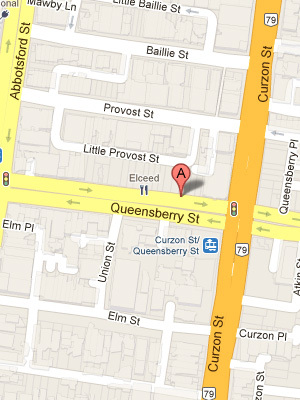 However, on the sign was a list of cafes that we perhaps may be interested in, and Twenty & Six was one of them. 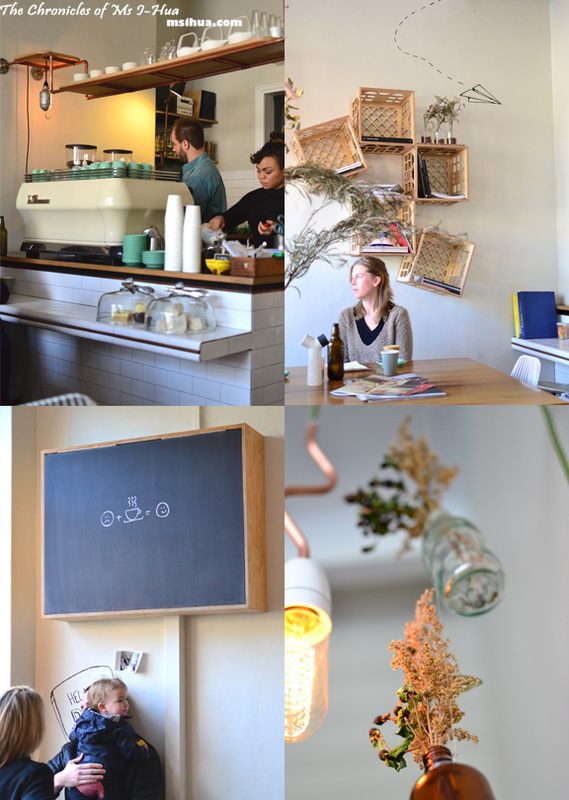 After a quick discussion, where we re-planned our morning, we headed off to North Melbourne to the tiny little cafe. Because we were still very early, we managed to avoid the late breakfast/brunch crowd that would come by later. 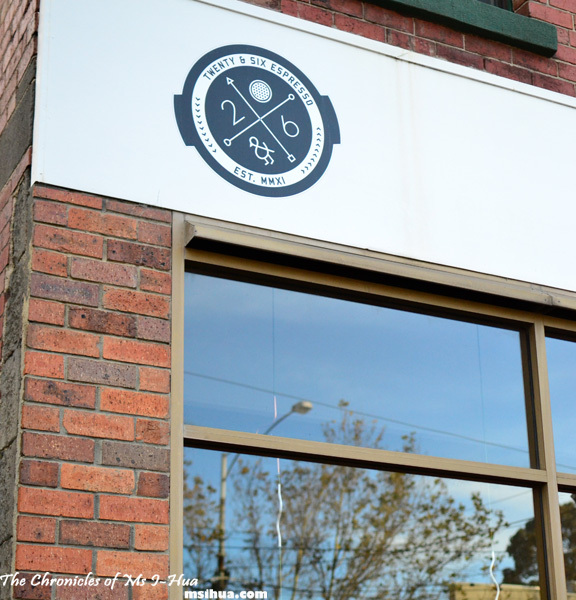 Despite having Auction Rooms nearby, Twenty & Six Espresso has its own crowd of breakfast/brunch lovers. The tiny cafe gets packed out at peak times and waiting for a spot is a norm especially on weekends. The cafe, although small in size, is filled with natural light thanks to the large glass panel and door. Decor is nice and simple with wooden crates used as displays and comic strip-like sketches adorn the walls. Take note of the sketch adorning one wall where a little boy has thrown his paper plane high in the sky. See if you can spot the paper plane on the stark white cafe walls or ceilings. 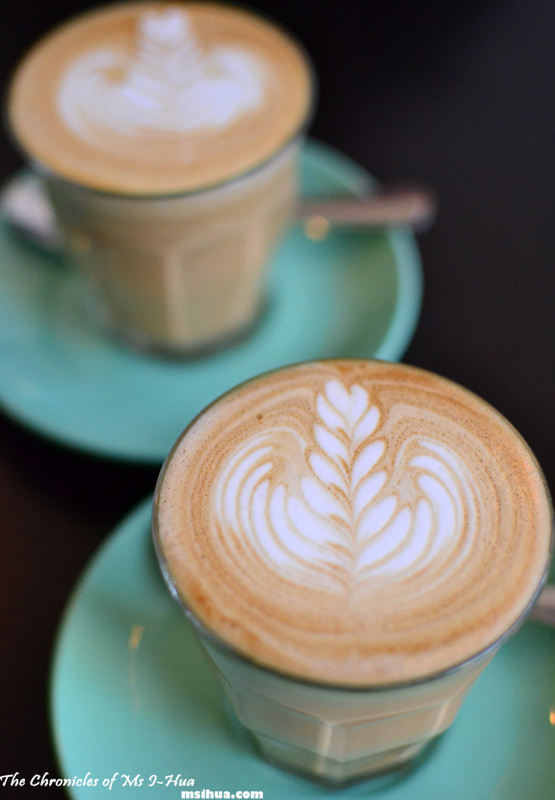 Latte ($3.80) – Proud Mary Honeysuckle Blend. A sweet blend that is creamy and zesty with undertones of chocolate. 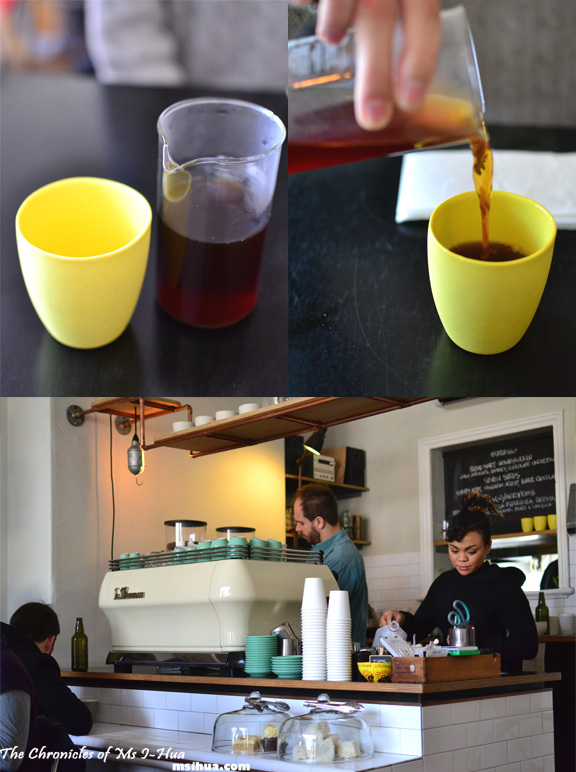 Twenty & Six Espresso uses Proud Mary beans as their house blend while Seven Seeds beans are used as their guest blend. 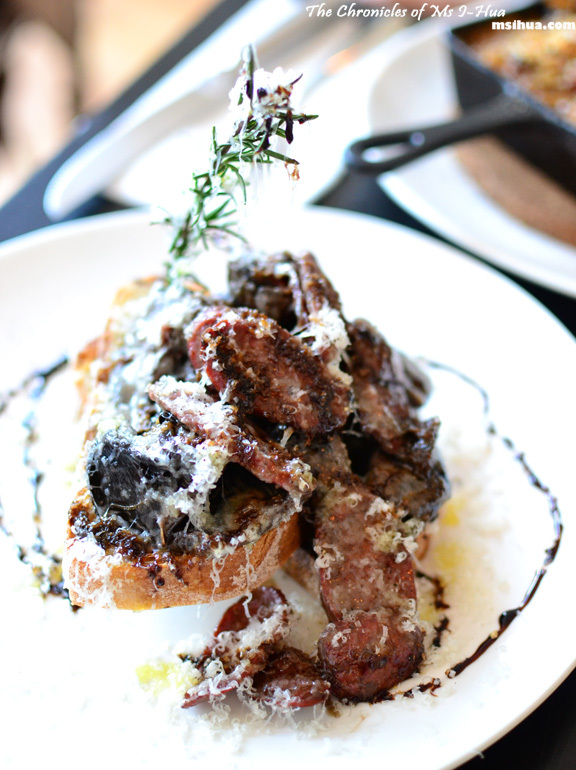 The Hunter ($16.90) – Balsamic roasted Portobello mushrooms, spicy Spanish chorizo, sourdough, creme fraiche and black truffle oil. As the dish was presented to our table, the strong scent of truffles emanated from the dish and assailed my senses. I was a little worried that the truffle oil would overpower the items on the dish but I needn’t have worried at all. The dish was rich and powerful. Laden with heaps of mushrooms and chorizo, it was of generous proportions. I couldn’t help but happily scrape the plate for more Parmesan shavings and balsamic dressing. It was so good. 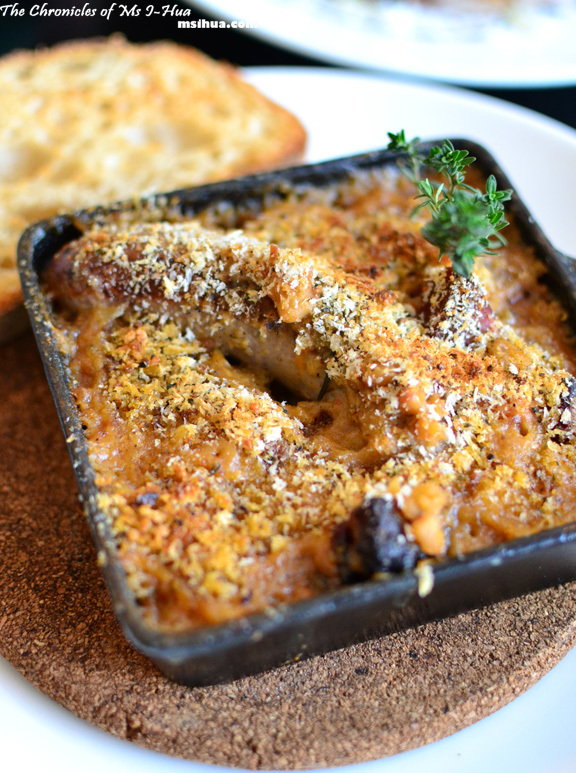 The Boy opted for The Cassoulet ($17.90) – Duck fat baked haricot beans with pancetta, pork & fennel sausage, sourdough and a garden herb crust. Who doesn’t like duck fat? The use of duck fat and pancetta gave the cassoulet that extra ooomph in the flavour department. The pork and fennel sausage had a nice char and was moist on the inside. This was definitely a heart-warming dish and perfect for this cold Melbourne winter. I also had a Pour-over Esperenza Geisha (Floral, Hazelnut, Pears, Vanilla & Caramel) at the end of my meal which I couldn’t pass on by once I knew there was a Geisha in the house. If you’re planning on visiting Twenty & Six Espresso on the weekends, definitely make a point to come early. The cafe is tiny and gets packed out on the weekends with hungry Melburnians wanting to fulfil their weekend breakfast ritual. There are no spaces for prams, but we did see many couples leaving their prams by the windows outside, so that they could keep an eye on it whilst enjoying breakfast with the bub. Yay, a new place near my uni! <3 Looks really promising! Mud? Is this some secret coded language Sarah? Holy smokes, that all looks amazing. LIKE WOW. Are you high or just packing and missing me and can’t think of anything cool and amusing to say? Like HOLY BEESWAX ANGLE BABE! THAT is the best writing you have ever done, jelly bean unicorn rake sway! Henry Higgins? I LOVE LOVE LOVE MY FAIR LADY! LOL thanks a lot. Here I am sitting at work reading your post and now I got pork and savoury breakfast cravings! So cozy and cute! 🙂 I have a weakness for Portobello mushrooms!!! So I would definitely go for the hunter!! Those mushrooms were so good! Oh I hate it when something is closed!!! Drives me crazy when I have been psyched up to eat there food! Great story, I loved the mushroom and chorizo dish, it looked delicious! I know right? So annoying! Luckily we found a good spot, or else the day would have been ruined! I’m really fond of their coffees. But their flavours have gone big and bold lately, which I know you’d like. The dish I had when they started was more to my liking. Still, I’d come back for their coffees! That pic on the chalk board was c=so cute, sad face + coffee = smiley face! BIG BOLD AND BEAUTIFUL 😛 I loved the chalk board too! Ashley recently posted…Bangkok! Temples, Buddhas, Cabbages and Condoms…. If duck fat is involved it’s a winner. I *bow* to the breakfast King and Queen.